Kérastase program creates beauty in three steps to sublimate the beauty of hair: bathe, treat and texturing with accurate massage. This program consists of three simple steps associated with Kérastase products, starting with a specific treatment in the salon and you can continue at home. Apply to wet hair starting at the ends massage. - Adapted for thin and thick hair. 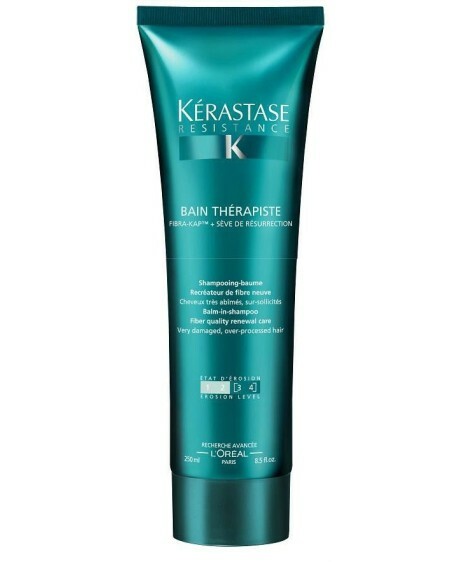 - Kaps - The guardians of the internal cohesion of hair: Kérastase has been constantly putting into question the structure of the hair and eventually became his obsession. After years of studies, L'Oreal Advanced Research has demonstrated the critical role played by Kaps (Keratin-associated protein), the main partners to ensure the hair structure. These small proteins keratins link between them and maintain the internal architecture of cabello.Un extraordinarily strong cohesive power, without which the fiber structure would collapse and lose its material and internal architecture. Flower sap Resurrection: Myrothamnus Flabellifolia is an amazing plant capable of coming back to life after having spent 10 years in a state of almost complete dehydration. Once in contact with the water returns to its original state and start a new life cycle. The Advanced Research L'Oreal has extracted the sap of this ancient and powerful plant that has been selected to enrich Kérastase Resistance Thérapiste formulas. SP94: Activators sintensis of KAPS. Naturally present in the hair have the ability to compensate for the loss of material. - 1 Hydrolyzed Wheat Protein: enriched with loads of cationic strong affinity with fiber enables you to restore your own uniform. - Fiber-Kaptm - Associated with the sap of the flower of the resurrection: Kérastase creates a powerful Fiber-Kaptm complex designed to compensate for the lack of Kaps associated with Gluco-peptide elSP94 with 6 Amino-acid and protein derivative wheat. Structure, stuffed and weakened hair sample. Internally strengthens and repairs the fiber. To the touch, the hair are more solid. Bathing / rinse / Available in 250ML and 1000ML / Exposure time 3 mnts.